Iced-over roads caused cars all over to slide off the road Wednesday night, and closed and delayed schools Thursday morning. From roads to bushes to jackets, northern New York was covered in a slick layer of ice Wednesday evening after temperatures fell from above freezing into the lower 20s. 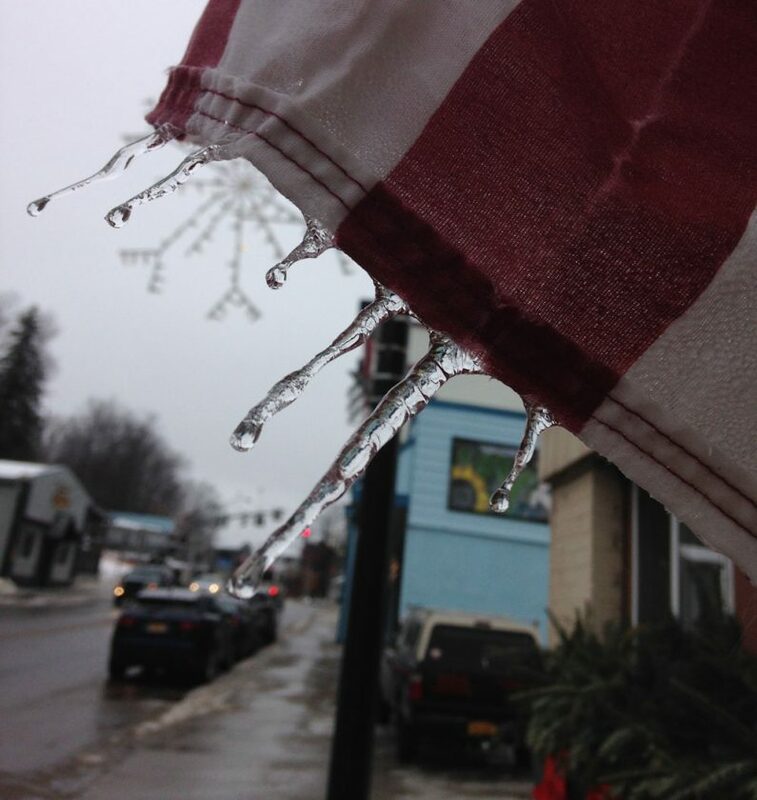 Schools closed Thursday included North Country Community College, Lake Placid, Saranac Lake, AuSable Forks, Beekmantown, Clinton Community College, Elizabethtown-Lewis, Keesville and Peru. Tender Care Daycare in Ray Brook was also closed. Tupper Lake, Keene, Malone and Moria were on a two-hour delay Thursday. State Police Troop B Public Information Officer Jennifer Fleishman said the troop responded to 14 calls from 4 p.m. Wednesday to 8 a.m. Thursday. Eight were in the Plattsburgh and Malone area, two were in St. Lawrence County and four were in the Tri-Lakes area. In Saranac Lake, there were two cars on Helen Street that spun sideways into snow banks around 5 p.m., according to village police Sgt. John Gay. Gay said the two vehicles did not hit each other, but that a third car slid in the road at the same time. He also said they helped someone who slipped and fell near Helen Street. Within the same hour, village police also responded to crashes on Lake Street and Rockland Avenue, and a bus slid on Ampersand Avenue. The Lake Placid Volunteer Fire Department responded to two separate two-car motor vehicle collisions. Fleishman said state Route 30 was closed for additional salting from 9 to 9:30 p.m.
She also said a trooper responded to a report of a plow sliding off the road near Lake Clear, but by the time they got there the situation had been resolved by the state Department of Transportation. There were several cars stuck on and off the road on state Route 30 because of the icy conditions, but no injuries or accidents, Fleishman added. A DOT worker told police the plow slid while trying to get around some stuck cars with its salter. Fleishman also said the plows had to return several times to put chains on tires and refill on salt. At 5:10 p.m. Wednesday, the Saranac and Cadyville volunteer fire departments were called out to a vehicle crash with entrapment near 2776 Route 3. Route 3 was shut down at Cringle Road at 5:15 p.m. The town of Jay declared a state of emergency at 5 p.m. Wednesday due to unexpected and severe flooding of the AuSable River in the town and its hamlets of AuSable Forks, Jay and Upper Jay. An ice jam has been a threat along the East Branch of the AuSable River for days in the Upper Jay area. Residents and town officials continue to monitor the situation Thursday. Director of Essex County Emergency Services Don Jaquish said state Route 9N was temporarily closed because of the ice jam. As of 8:45 a.m. Jaquish said he was still trying to get an update on the situation. The roads can be dangerous, but walking around can be just as hazardous. The Winona Avenue hill, leading up to North Country Community College’s Saranac Lake campus, was too slippery for vehicles to drive up. As some people carefully walked up the hill, others slid down it, such as Samuel Coffman who works at NCCC. Meanwhile, three cars were stopped at top of the hill as one car was stuck across the road, until a village sand truck came to the rescue. 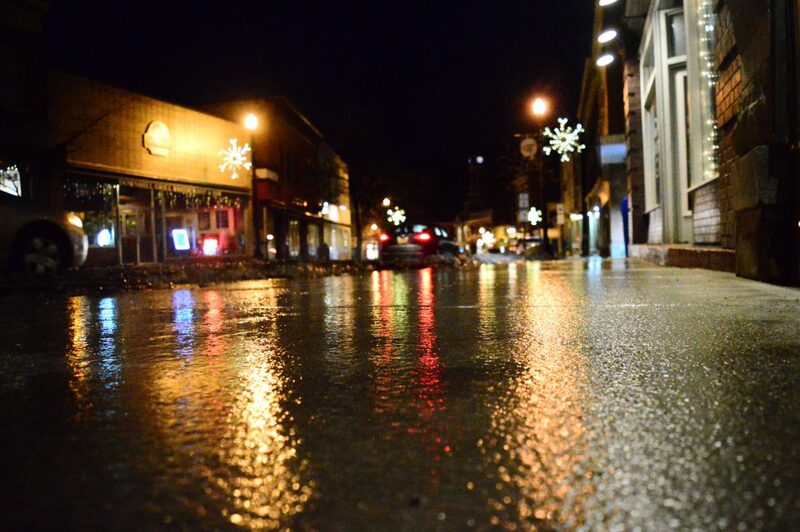 With no friction on most parking lots, sidewalks and driveways, slips and slides are inevitable when walking around. Traction cleats that strap onto boots can help minimize the danger of walking on a sheet of ice. They will not prevent against all slips — they are no match for the large ice buildups around streetlights and crosswalks that send feet sliding downward — but they can avoid bashed elbows, slips into roads and bruised egos. Staff Writer Griffin Kelly and Publisher Catherine Moore contributed to this report.